Our company is detailed, quality-oriented and dedicated to providing outstanding service on each project that we do. 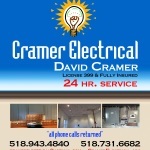 Cramer Electrical provides a superior project experience. Find out why homeowners prefer our services above the rest! Cramer Electrical prides itself on quality workmanship and uses only the best materials available to keep you and your family safe, such as Square ‘D’ brand breakers/panels when appropriate. No matter the size of the job, all work is done within National Code guidelines. Our services include electrical wiring and panel upgrades; troubleshooting, electrical switches, outlets, fixture repair and installation; ceiling fans; electrical baseboard or wall heater repair and installation; generators; and cable TV, modem and phone wiring (low voltage). Master Electrician License #399 ( DBA Cramer Electrical, Catskill Electrician ). Seniors over 62 Years of Age and Veterans that own their Residence.